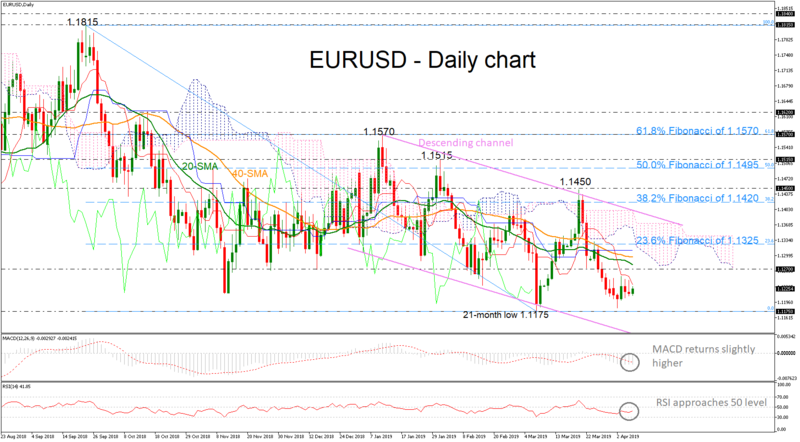 EURUSD moved lower in the previous week but it managed to hold above the 21-month low of 1.1175, remaining in a downward sloping channel over the last three months. Prices hold below the red Tenkan-sen line, which is pointing down, suggesting a bearish view in the short-term. Moreover, the 20-and 40-simple moving averages (SMAs) are following the price action while the technical indicators are endorsing an opposite picture. Specifically, the MACD oscillator is heading slightly higher in the negative zone and the RSI is approaching the 50 level. If the price continues today’s upside structure, immediate resistance would come from the 1.1270 barrier, before touching the 20- and then the 40-SMAs around 1.1280 and 1.1300. If there is a successful break above this area, the price is likely to find the next obstacle around the 23.6% Fibonacci retracement level of the downleg from 1.1815 to 1.1175, near 1.1325. Higher up, the 38.2% Fibonacci of 1.1420 and the descending trend line would be the next targets. On the other hand, in case of a sell-off, support would come from the 21-month low of 1.1175 while a retreat even lower would initially find a pause at the 1.1115 area, taken from the low on June 2017. More losses could send the price until the 1.0830 support, identified by the highs on January 2017. In the medium-term picture, a dive beneath 1.1175 would bring the bearish outlook into play again. However, if the momentum indicators prove that the bearish move came to an end for now, this could drive EURUSD towards the upper boundary of the descending channel.